When it comes to pursuing a goal, there will undoubtedly be obstacles in your way. Recent research by the University of Scranton says that only 8% of people who set New Years Resolutions ever accomplish them! The stress and obstacles of life are often a consistent so it takes focus to rise above. 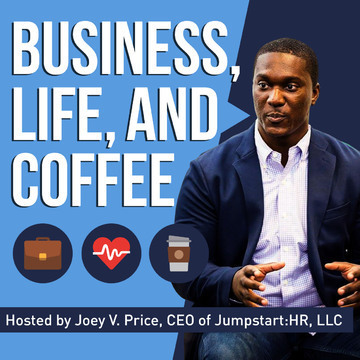 This episode of the Business, Life, and Coffee show is very special because we'll be speaking with a professional athlete, Pratik Shinde, who knows quite a bit about overcoming obstacles. From early family tragedy to the rigors of life as a high-level pro athelete away from home, Pratik shares his story and hopefully it motivates you to succeed! Pratik Shinde is the 22 year old midfielder for the Houston Hurricanes FC. Formerly of Mumbai, India, Pratik now plays in the US and is the youngest Indian player to sign a foreign Football contract at age 15. You can find him on Twitter at PS7Official and visit his website at www.pratikshindeofficial.com. 70 - Your Child, Your Choice… What are Your Education Options? Across the country, more and more families are discovering the power of school choice, including traditional public schools, public charter schools, magnet schools, private schools, online learning, and homeschooling. National School Choice Week is a nonpartisan, nonpolitical public awareness effort that shines a positive spotlight on effective education options for children. During the week of January 22-28, 2017, thousands of events will be held nationwide focusing on K-12 education and celebrating educational opportunity. Andrew Campanella, the president of National School Choice Week, discusses school choice across America. National School Choice Week President Andrew Campanella is an outspoken advocate for providing all children with access to effective, excellent educational environments. Recognized as one of the education reform movement’s most effective media strategists and public outreach experts, Andrew has worked on a variety of education reform policy issues – from public charter schooling and private school choice programs to public school district teacher recruitment. According to recent research, the average U.S. Household carries over $16,000 in credit card debt, $28,000 in auto loans, and almost $50,000 in student loans. That's MORE debt than the average household income! Every year we commit to better finances and ultimately a better life, but for some reason, the process is so mystifying. Joining us today to discuss your personal finances and her own story of entrepreneurship and good money management is Dominique Broadway, Founder and Personal Finance Coach at Finances De•mys•ti•fied. You can find her on Facebook, Twitter, and Instagram using the links shared below. Dominique Broadway is an award winning Financial Planner, Personal Finance Coach, Speaker, Finance Expert, Entrepreneur and the Founder of Finances De•mys•ti•fied & The Social Money Tour. She has a strong passion for working with young professionals, entrepreneurs and people of all ages to bring their Dreams2Reality. Dominique began working at major brokerage firms such as UBS Financial Services and Edelman Financial Services, at the ripe age of 21, focusing on clients with $10 million and up in investable assets. Shortly after launching Finances De•mys•ti•fied, an award winning organization that provides Personal Finance Coaching & Financial Capability solutions, she was named one of the top Financial Advisors in the United States for Millennials, at the age of 28. These days, there are so many factors getting in the way of saving for retirement. On this episode, American's Wealth Coach Deborah Owens tackles them head on and gives you the tools you need to stay the course and have a satisfying seven-figure retirement! Deborah Owens is a former financial services executive who is on a mission to help individuals navigate their lives in challenging economic times. After spending most of her professional career in sales management and business development roles, she finally recognized that her greatest satisfaction resulted from training and developing others. Throughout her career, she was sought out as a “coach and confidant” by colleagues and measured my leadership effectiveness by her ability to help others succeed. After the publication of her third book and subsequent national book tour, she has focused on the professional development of financial advisors, high potential emerging leaders and entrepreneurs as an independent consultant and corporate trainer. As the principal of Owens Media Group, she collaborates with leaders in the executive suite of major brands to create training that aligns with the business objectives of the organization. Her unique differentiation is the ability to communicate, translate and present complex concepts that appeal to broad audiences. Book - "A Purse of Your Own"
Many people love to celebrate during the holidays during family gatherings, office parties, and other celebrations, but some people may drink beyond their limits. Adverse consequences can range from family fights or relationship problems, to accidents or embarrassing situations with co-workers. And for people who spend a lot of time drinking—including finding themselves craving alcohol or drinking more to get the same effect—this may be a sign of an ongoing alcohol use disorder (AUD). The start of a new year is a good time to look back at your behavior over the holidays, take stock of your own or your close friends’ or family members’ drinking patterns, and to consider ways to cut back or stop if alcohol is causing harm. The National Institute on Alcohol Abuse and Alcoholism’s (NIAAA) online resource, RethinkingDrinking.niaaa.nih.gov, allows people to take a quick drinking pattern checkup, learn about signs of a problem, and get tips to cut back or stop. Additionally, NIAAA’s free booklet, Treatment for Alcohol Problems: Finding and Getting Help, covers the latest research-based treatments—such as behavioral treatments and medications—and what to consider when choosing among them. Dr. George F. Koob, Director of NIAAA at the National Institutes of Health, is an internationally-recognized expert on alcohol and the neurobiology of alcohol and drug addiction. Dr. Koob began his career investigating the neurobiology of emotion, particularly how the brain processes reward and stress. He subsequently applied basic research on emotions, including on the anatomical and neurochemical underpinnings of emotional function, to alcohol and drug addiction, significantly broadening knowledge of the adaptations within reward and stress neurocircuits that lead to addiction. This work has advanced our understanding of the physiological effects of alcohol and other substance use and why some people transition from use to misuse to addiction, while others do not. Dr. Koob oversees a wide range of alcohol-related research, including genetics, neuroscience, epidemiology, prevention, and treatment. He is the author of more than 650 peer-reviewed scientific papers, and the co-author of The Neurobiology of Addiction, a comprehensive review of the most critical neurobiology of addiction research conducted over the past 50 years.